Only 7 Northern White Rhinos remain on planet earth! – If Animals Could Talk . . .
Only 7 Northern White Rhinos remain on planet earth! How did this happen? What can we do? If you want to help, the instructions are below. If nothing else, this is a lesson on critically endangered animals. And, if you have the opportunity, go visit Nola at the incredibly amazing Safari Park in Escondido, California…before it’s too late. As this is the last weekend of our March HEROES WANTED campaign, we wanted to introduce you to a very special animal. This is Nola, a 42-year-old northern white rhino. She was born in the southern savanna woodlands of Sudan and rescued from the violent poaching that is prevalent in that region when she was only a few years old. 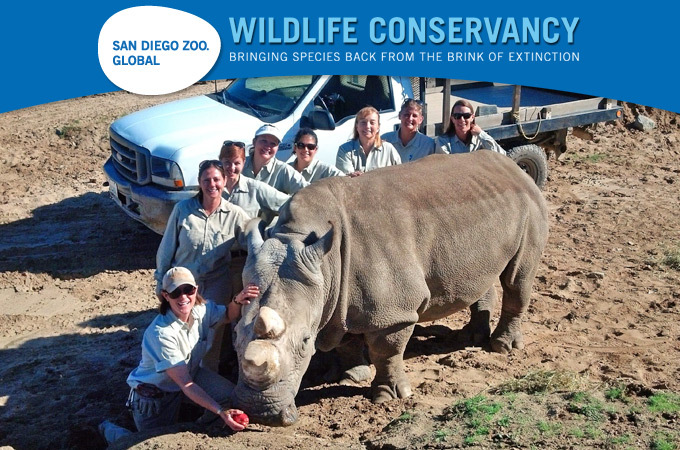 Since that time, our San Diego Zoo Global staff have cared for Nola, loved her, and served as her extended family. She lives in a 50-acre habitat at our Safari Park facility in Escondido, California, where she shares her range with herds of gazelles, giraffes, and Cape buffalo—and it is a world away from the poachers who claimed her family. As any rhino might, Nola enjoys her daily belly scratches and neck rubs, carrots, and the occasional bucket of apples. She spends her days indulging in the warm Southern California weather, sunbathing next to her northern white rhino beau, Angalifu—she doesn’t actually care for him that much, but that’s another story. A girl has the right to be choosy! In addition to all the individual characteristics that make Nola special, there is something else: she is one of only 7 remaining northern white rhinos on planet Earth. Not 700, or even 70, but just 7. When saying that we work to save the most endangered species on this planet—animals like this, like Nola—this is what we are talking about. As mentioned above, this is the last weekend for our March HEROES WANTED campaign. Hundreds of people from around the globe have already stepped forward to become our newest Wildlife Heroes, our amazing group of monthly donors, but you are still desperately needed. For as little as 33 cents a day, you can join the Wildlife Conservancy and fight for vulnerable animals—like Nola—that need you most. You can make a significant difference for critically endangered wildlife around the globe today, all for just pennies a day! I implore you to stand up for the animals and habitats that desperately need you today. For Nola, and for the countless others we have dedicated our lives to save and protect, thank you in advance for your time and consideration. We look forward to welcoming you to the Wildlife Conservancy family today! This entry was posted in Endangered Animals and tagged Critically Endangered, Northern White Rhinoceros, Rhino Endangered Animals. Bookmark the permalink.